With the revolution of eCommerce websites and online store, shopping habits took an extreme turn as everything is available just on a click. Also, it has increased the frequency by which user shop on a daily basis. To meet the demand of customers, manufactures and retailers have to come up with creative designs and try to please the growing customer base. Giving the freedom to the customers to design and order product according to their expectation is an ultimate way to balance the chain of demand and supply. The customized products like t-shirts, greetings cards and mugs are a huge hit with every age group around the world. 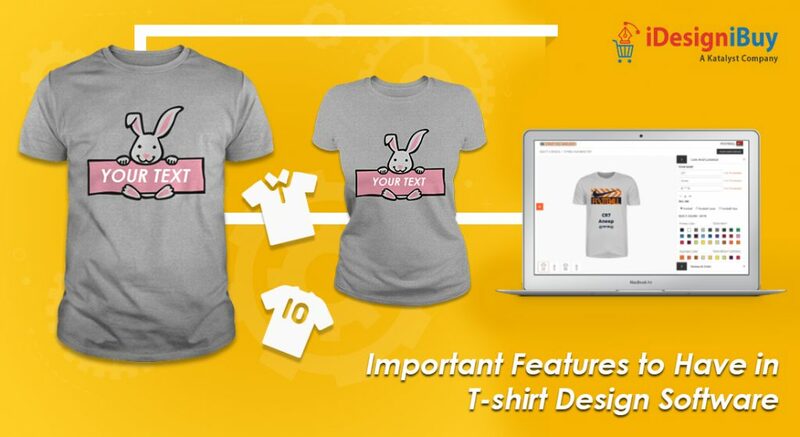 Here, we will discuss some must-have features that you should look for while selecting tshirt design software or any designing software to make your online store more fun and interactive for your users. Integrating tailoring software not only makes your website interactive, but it also offers a platform for your customers to customize their products by utilizing their creativity. The designing is the most crucial area; it generally has several components that come together to create a perfect picture. However, your customers might not be the designers or artists, but they might have a basic understanding about designs because of social media. By providing some random designing platform which limits them in one designing area might disappoint them. So, providing multiple design areas facilitates users to design their product and would give an impression that you understand their designing requirements. Restricting the designs to a few elements won’t be valued by any of your consumers. Providing them multiple options to choose from is what will make you popular among your target audiences. While selecting a tshirt designer tool to integrate with your website or online store, ensure that it has advanced clipart feature that will facilitate your users to add an effect, resize or crop. Imagine a customer is looking to design a t-shirt that says “The Best Sister.” It is obvious that the customer will look for an option to add images that goes with that quote. And if you can provide them what they want with tailoring software having an option to upload a custom image. This way you can facilitate your users to upload images to give their product a personal feel. Running an online printing business is not an easy task. As a business owner, you have to understand customers’ requirements, follow the latest printing trends and have to watch out for the latest images and quotes. Along with this, you also have to provide them choices of colors to select for any specific design because one color doesn’t fit for everyone. To offer this facility, your designing tools must have a feature to manage print colors of products that are listed on your online store or website. Many organizations run business with a goal to close deals with large-scale enterprises and big accounts. And to achieve that goal, you have to serve these large-scale organizations with what they expect. Now the question arises what they want? To start with, any customer will look for advanced designing tools with features like a background eraser, group & move objects, masking effect and brush tool among others. Moreover, your website or online store should have a facility to order in bulk. As mentioned in the above section, the brush tool is one of the advanced features that add an edge over your competitors. This tool gives the freedom to the individual to include a personalized spin to their creations. This not only makes your existing customer base happy, but it will help you grow your business by reaching more and more customer segments. Are you also running a tshirt printing business and thinking about incorporating tailoring software to offer customization option to your users? You should visit and try iDesigniBuy’s designing tool that has all the advanced features.